Royal Caribbean is offering three themed cruises in South America for the 2014/2015 cruise season. The cruises are called Royal Life, Royal Gourmet and Royal Dance. Royal Life will be a seven-night cruise out of Santos, Brazil on February 1, 2014 and will stop in Buenos Aires, Montevideo and Punta del Este. This cruise will offer exercise regiments as well as light and healthy food choices. Royal Gourmet will be a cruise sailing on March 13, 2014 with stops in Buenos Aires, Montevideo and Punta del Este. Royal Gourmet will bring together a number of major Brazilian chefs that will offer unique programming. For Royal Dance, Royal Caribbean is partnering with the Dance Studio of Dance Fernando Campani. The cruise will offer the studios' intense class schedule, with a 14-night trans-Atlantic itinerary that will end in Barcelona, Spain. 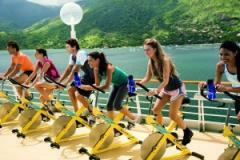 Royal Caribbean is bringing back its sports and fitness program for this year's cruise season, called "Royal Life". With cruises out of Santos, Brazil on January 27 and Rio de Janeiro on January 28, the goal is to combine leisure cruise vacation, wellness and health care. On board, passengers will be able to exercise, attend lectures on nutritional counseling and relaxation. The Royal Life cruise costs from R$ 203.80 10x + R$ 81.52 per person, no fees, inside cabin double. The feeding schedule and activities are included.